Well it has been a long dream coming, but on Wednesday, I finally saw it come true. For every milestone, there is a story and so here is mine. About three years or so ago, I took a Logos training class which blew my mind wide open to the amazing Bible software that is Logos. I used it and loved it and then took Logos 2, an advanced course. 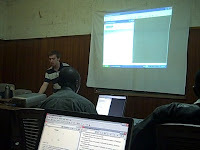 During this time, I began speaking with a friend who works at Logos who is in charge of special projects and we began dreaming of what it would it would look like to get Logos into Zambia so that pastors who do not have the money for books or even Bibles could study and use these great tools. So with a few fish and a couple loaves, some Logos Bible Study software and the Moody’s AM Bible Courseware we hoped to get a Pastor Resource Library up and running. Well, if you followed my first year in Zambia, you'll remember it was a crazy one. With malaria and concussions and the sickness of my wife, and just learning to live in Zambia, the dream was never realized. Then, we came back home to Bellingham last June to have our fourth baby. I got together again with my friends at Logos (their headquarters is in Bellingham) and we kept talking, dreaming and praying. Well, toward the end of my stay in Bellingham, a bunch of things happened. First, some people donated some money for our missionary venture back to Zambia. Then, Rob Taylor, the IT guy at Action International, who I had told about this Logos dream, found ten great refurbished laptops from the Gates Foundation that were for sale. We used the donation from those generous friends to buy these laptops. Then a friend bought four more copies and then donated them to the Africa pastors. And then, how to get them all here.. Well, we carried two over in January. The Knifongs and Huckby's, when they came over, each brought two more. Tyler brought two and then Pete brought one. So we got the computers, we had logos, but we needed someone to teach computers to people who have never used computers... Daunting? YES! Crazy? Probably. Impossible? NO WAY! Now, I could teach Logos, but during my first three months, I realized I didn't have the margin to be able to painstakingly take these pastors through the training due to my full schedule. So, when Tyler asked about an internship a few months ago to finish his college degree, it was a no brainer to ask him to come and teach the pastors how to one, use a computer and two, use Logos. 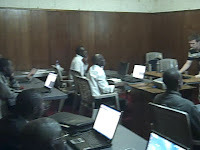 And after some challenges, a bunch of bumps, sighs and some frustrated laughs teaching the basics of computers, we finally began the training of Logos on Monday. It was amazing and hard... Things that I didn't think would be issues were, and things that I did, uh, were also hard. Tyler was patient and patient and patient and I helped from the back of the room as I could. We had another full class on Wednesday, and then towards the end of class, we had a breakthrough. One of the pastors asked, "Now, how do I get this information from Logos to the printer or to my documents?" That completed the circle. See it is great using the program to learn how to learn about the word, and use the commentaries and dictionaries and the concordances and so much more, but if you can't use the info either by printing it or saving it to working document to take home with you, it would be pointless. (Only one of them has a computer.) They all knew how to get it from Logos to the Microsoft Word by copying and how to save it in their documents. IT WAS SO GREAT!!! It was hard during the process. Teaching always is. But, I wish you could have been there as they got glimpses of how much this could help their studies, as well as the joy of learning how to use a computer. They were like little kids. Not only are they gaining skills that they could use possibly in a job or for their pastoring, but they are gaining confidence. I also got the sense that they really believe we care about them, that we are trying to do all we can to train them so they can use what they have to bless others.